If more than half of over-the-counter acne treatments all use acne medications like benzoyl peroxide or green tea, what makes any of them any better than the rest? A lot of remedies try different delivery methods to address acne or combination treatments. Will Clear Therapy finally give you the results you’ve been looking for? We need to take a close look at the ingredients before we can recommend using this product. 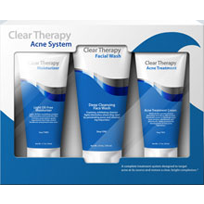 Clear Therapy is a three step anti-acne system that should help you deal with major acne breakouts.Clear Therapy works to remove excess oil, kill bacteria, and help restore healthier looking skin. The system offers an acne wash, acne treatment, and moisturizer. The combination therapy helps cleanse the skin and promote strong skin to avoid breakouts. The acne wash uses a blend of pumice and walnut shell to exfoliate the skin. While exfoliating, the wash delivers benzoyl peroxide to kill bacteria.After the skin is cleansed, Clear Therapy provides a spot treatment and cream. The acne treatment uses an additional 5% benzoyl peroxide to really get rid of any bacteria on the skin and inside pores. The treatment also has tea tree oil, chamomile extract, and aloe extract for antioxidant benefits.The final touch for Clear Therapy is the moisturizer. The moisturizer uses hyaluronic acid, jojoba seed oil, hydrolyzed collagen and hydrolyzed elastic. The blend offers nutrients and hydration for the skin. The moisturizer should help reduce potential side effects from the application of benzoyl peroxide like dryness and irritation. Overall, Clear Therapy is a decent acne treatment. The main concern about this system is its striking resemblance to another acne treatment called RevitaClear. These two systems don’t just have similar ingredients; they both have the same delivery methods and formulas. Clear Therapy and RevitaClear are nearly identical, and the fact that you can’t contact either company in any way other than email sends a rippling effect of suspicion about either treatment.